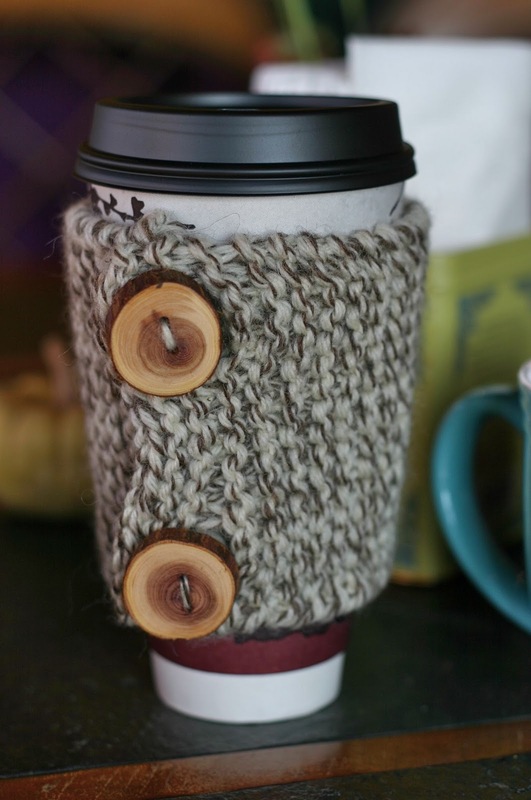 A hand knit coffee cozy makes a simple, quick, meaningful knit for every coffee lover in your life. Every Wednesday, Friday, and Sunday mornings, my girlfriends and I gather together at the coffee shop and knit, and talk, and laugh, and cry, and knit some more. Some of us are happy just to watch, while some of us knit row after row of perfectly executed garter stitch, and some of us are just a wee bit obsessed. The magic of our needles and camaraderie brings an ever changing blend of men, women, grandparents and children to the large round table; watching in awe or sharing stories. I have come to appreciate each and every person who has passed through our group, and have come to depend on this profound connection we’ve created with each other. I also know that we are not the only ones panicking, so I have a gift for you. 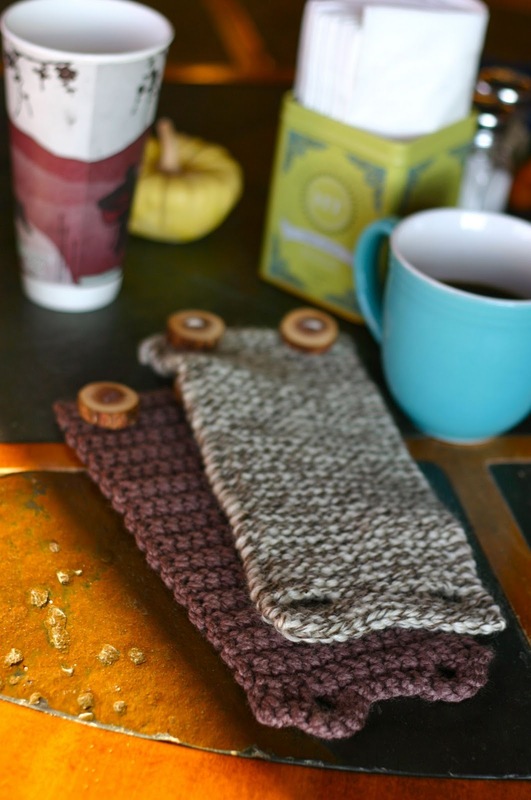 An easy, quick gift to make… Coffee Cozy Knitting Pattern for all your coffee loving friends. They are so fast and easy, fit just about any size cup, and I bet you could make enough for all your family & friends in one weekend! Better yet, grab a bunch of your favorite knitting (or crocheting) friends and spend the afternoon together cranking them out! The pattern for the coffee cozy above is available in a FREE downloadable PDF that includes both the knit and crochet version. Please follow the directions in the gray box below and it will be sent directly to your inbox. Note: Current Subscribers can re-enter their names but won’t be double subscribed. and be the first to know when we restock the shop with Upcycled Project Bags. Your information will NEVER be shared. If you're already a SUBSCRIBER, just re-enter your email then check your inbox. 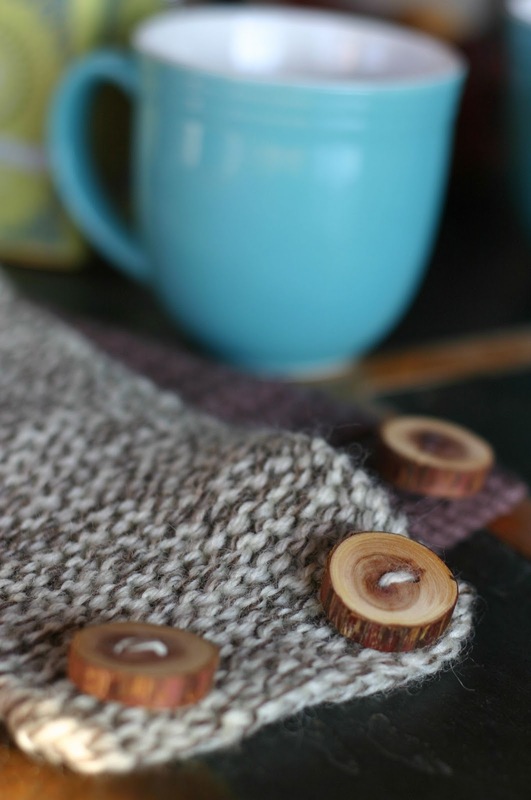 The Coffee Cozy Knitting Pattern is such a fun and easy pattern! You can also modify this cozy pattern by changing to another basic stitch pattern, like seed stitch, moss stitch a simple cable or even a 2×2 ribbing. The possibilities are endless. I hope you make lots and lots of them! Thanks Elizabeth, what a great idea! This may just be the little project I need to motivate me to learn to knit. ( gasp. it is true, I can't knit a stitch!) I'll let you know how it goes. as someone who can only knit in squares and rectangles, i love this. They should use these at Starbucks instead of throwing away all that cardboard. Can you start a movement here? Love these! What size buttons did you use? Thanks! thank you so much, I was looking for a pattern for these and you had the cutest I found on ravelry. I'll let you know how my crochet version goes. You are so welcome, Leanne! I'm really glad you're enjoying the pattern:) Gift away, however, the patterns and all items made from them are for personal use only. I absolutely love these! I'm a beginner knitter, and I'd love to give these as Christmas gifts this year! 1. When you were making the buttons, what methods of binding off and casting on did you use? In my "trial version," the button holes just came out as messy holes, lol. 2. Can you post a link to your Etsy shop where I can buy those adorable buttons? P.S. I tried using a few lines of t-shirt paint on the back, and it worked GREAT with my ceramic mug. I think I'm going to use it to write my "Merry Christmas, _____! Love, Katie" message on the inside! Hi there, I'm new to crochet and I really wanted to make something like this for Christmas gifts. Love the pattern but I'm confused about the last thing: "To finish it off, single crochet in each stitch and bind off. (I skipped the stitch before and after each chain so that it doesn't bulge)" – do you do a SC in each chain stitch around the button holes? Thank you! To be honest, I don't really remember, Dianna, and I'm not very good with technical terms when it comes to crochet;) I think it means that I skipped a stitch before and after each buttonhole and yes, sc in each chain around the button holes. Let me know if you need more help! Love this pattern! I just finished making one for my friend for her birthday. Do you have a video of you making it. I have a super hard time following patterns. It most be nice to sit and hang out with your artistic friends. They most help you on your projects? Do you get most of your ideas from their work? I love this and I love your blog! I'm so happy to have run across your site! So quick and easy – Thanks!! you could try and hot glue gun around the inside,top and bottom or random whatever pattern you can manage. Haven't tried it but that might work. Hi! Wow, what an easy pattern and fun to make!! Would it be okay if I sell the Coffee Cozies I make from your pattern at a craft fair? Great starting pattern! I've sketched about 8 designs for coffee cozies so far. Thanks! Wow! Where did you get your buttons? There're awesome! I am new to knitting buttonholes and found this tutorial VERY helpful! Although, you may need to use slightly smaller buttons. Thanks so much for these ideas – I have a new brother-in-law and had no idea what to make him for Xmas – until I saw the mug and warmer!!! He LOVES coffee and this will be the perfect gift for him. Would like to try this for christmas gifts! Is chunky yarn the same as bulky or super bulky? Since the worsted is held double, Size 8 would be just fine for the thicker yarns. Some worsted's are fairly thin, so if the fabric seems too flimsy, go down a needle size.